While your humble editor is on the road dealing with stressful family business – it’s the eighth consecutive week for him to stray from the friendly Champaign-Urbana confines, so be kind when he actually materializes before you – and the eager elves at the Secret MICRO-FILM Headquarters hammer away at C-U Confidential #9 – the struggle is quite real to finish up and then release it two weeks from today on Friday, April 21 – we’d like to call brief attention to an upcoming screening. (You will understand shortly why we felt the need to designate this event as “Flicker of the Week” despite hanging up the critic’s cap.) Our do-it-yourself culture confidant David Gracon has finally brought his Hallways Microcinema series out into the open with Vol. 19 taking place this Sunday, April 9, 7:30 p.m., at the Art Theater Co-op, 126 W. Church St., Champaign. Local improvisational quartet SUNSAT IV opens with a mini-concert after which Hallways will present a new documentary on the nonconformist media icon Tony Conrad, who passed away on the same date a year ago at age 76. 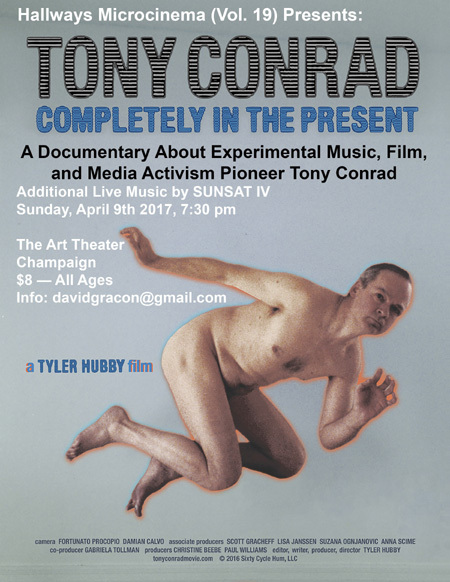 Tyler Hubby’s film, TONY CONRAD: COMPLETELY IN THE PRESENT, spans his life and career to explore a “playfully radical approach to art-making” that encompassed a true passion for blasting through established genres, formats, and pretensions. His signature experimental film, THE FLICKER (1966), is a black-and-white minimalist journey while his most famous movie association, FLAMING CREATURES (1963), involved soundtrack contributions to the seminal Jack Smith short subject. Also opening this evening at 6:30 p.m. is the Art’s entry in the Boneyard Arts Festival, an exhibit featuring works by Art staff members Lainey Waugh and Jessie Seitz; the reception is free for the public although Hallways 19 will cost a reasonable $8 to attend. The TONY CONRAD preview embedded here does a good job teasing at Conrad’s eclectic achievements in music composition, video production, university instruction, and overall lack of regard for the establishment. On the other hand, we simply could not pass on sharing the tongue-in-cheek(s) show flier below. The event is a personal tribute to Conrad by Gracon, who was a student under the late provocateur while attending the University of Buffalo-SUNY. This entry was posted on Friday, April 7th, 2017 at 1:00 pm	and is filed under Calendar du C-U, Flick Picks du C-U, Public Events. You can follow any responses to this entry through the RSS 2.0 feed. Both comments and pings are currently closed.